Behold thou shalt conceive in thy womb, and shalt bring forth a son; and thou shalt call his name Jesus. He shall be great, and shall be called the Son of the most High; and the Lord God shall give unto him the throne of David his father; and he shall reign in the house of Jacob for ever. Picture the scene of the Annunciation. God proposes the mystery of the Incarnation which He will accomplish in the Virgin Mary—but not until she has given her consent. 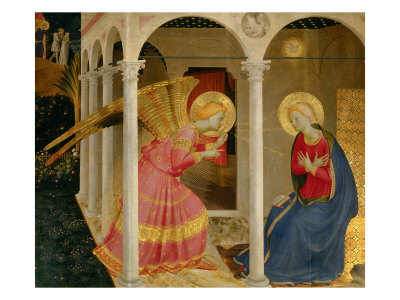 The accomplishment of the mystery is held in suspense awaiting the free acceptance of Mary. At this moment Mary represents all of us in her own person; it is as if God is waiting for the response of the humanity to which He longs to unite Himself. What a solemn moment this is! For upon this moment depends the decision of the most vital mystery of Christianity. But see how Mary gives her answer. Full of faith and confidence in the heavenly message and entirely submissive to the Divine Will, the Virgin Mary replies in a spirit of complete and absolute abandonment: "Behold the handmaid of the Lord; be it done to me according to Thy word." This "Fiat" is Mary's consent to the Divine Plan of Redemption. It is like an echo of the "Fiat" of the creation of the world. But this is a new world, a world infinitely superior, a world of grace, which God will cause to arise in consequence of Mary's consent, for at that moment the Divine Word, the second Person of the Blessed Trinity, becomes Man in Mary: "And the Word was made Flesh and dwelt among us."